This passage continues to amaze me. In our church, we give special significance to Jesus' words earlier in the Gospel of John when he says "I and the Father are one." (John 10:30) We do not separate God into different "persons" of the Father, Son, and Holy Spirit as many other Christian churches do. Rather, we see these three as different parts of the one and only divine person--the Lord God Jesus Christ. When Jesus says, "I and the Father are one," we think, "Of course. Just the way my body and soul make one person." This all makes perfect sense. But then Jesus throws a wrench in the works. He says that he has given us the glory that the Father has given him, so that we may all be one in the same way the Father and Son--and the Holy Spirit also--are one. How can we be one with the Lord in the same way the Lord's own divine soul and body are one? How can Jesus be in us just as the Father is in him? It seems almost blasphemous to presume that we would have the same relationship--the same oneness--with the Lord that the Lord has within himself. Yet it was the Lord himself who said these words. This is an especially appropriate issue to explore this morning, as we approach the Lord's table for holy communion. Our very word "communion" comes from a Latin word whose root means to bind together. If we follow this meaning, when we take communion we are somehow being joined together. But with whom, and how? Of course, communion is a . . . well . . . communal thing. We do not do it alone in our rooms. Rather, we come together as a faith community to celebrate the Lord's supper together. In this, it is similar to a family meal. In our families we traditionally have at least one meal each day together--though if it is a particularly busy family, our gathering around the dinner table may take place only once or twice a week. If the family is a happy one, our times together at the supper table do bring us closer together with our children, our parents, our brothers and sisters, and other friends and family members who share meals with us. In the case of my own family when I was growing up, it was quite an event to have all ten of us around our big, round table every evening for supper! A church is also a kind of family. However, though we often share our church with members of our biological family, that is not the primary bond that holds a church family together. The church is not based on material relationships, but on spiritual ones. We share a church with each other because we share a common faith with each other. Each of us comes to this church, not only because many of us have relatives here, but because we wish to approach the Lord with others who share our belief that God is one, and is the Lord Jesus Christ. We wish to share the Holy Supper with others who see deeper levels of spiritual meaning in the bread and wine that we take into our bodies. We wish to share our church with others who believe that the Lord's salvation is available to all who will live in the best way they know how, according to their own beliefs. When we are out in the world, we find that many people do not share these beliefs with us. Some believe that only those who belong to their church are saved. Some believe that the bread and wine of communion represent the body and blood of Christ given in a very literal way--in the crucifixion--to satisfy the justice of an angry Father who demands punishment for his wayward children. Others have still different beliefs that do not agree with our own. Some do not believe in God at all--and may ridicule those who do. Others are simply not interested in religion, nor in thinking deeply about life and its meaning. While the world may not hate us, the world is often indifferent--and occasionally hostile--to the beliefs that we hold dear. When we come together at this church, we can feel a oneness of faith with each other that we cannot find anywhere else. Yet as wonderful as this faith connection with each other is, Jesus' words in John lead us to look for an even deeper kind of oneness. He said that we would be one with him in the same way he is one with the Father. Completely one. What could this oneness be? What is the oneness that Jesus had with the Father--with the divine being that is the center and the creator of the universe? This oneness has to do, not just with beliefs, but with love. To complete the sentence in our text from John, Jesus says, ". . . that they may become completely one, so that the world may know that you have sent me and have loved them even as you have loved me." (John 17:23) Our oneness with the Lord has more to do with a sharing of love than with a sharing of beliefs. When we think about it, it is hard to say that the Lord even has "beliefs" in the way that we do. We grasp a small bit of the truth as seen reflected in the Bible, our church's teachings, and many other sources of understanding here on earth. But the Lord is universal truth. The Lord does not have to believe in anything because the Lord is everything good and true that could possibly be worthy of belief. While we share beliefs with each other, and hope that our beliefs approach the divine truth that is the Lord, it is love that first and foremost binds us together with the Lord. Love is also what binds us most closely to each other. As members of the same church, we do share beliefs with each other, and those beliefs do bring us together. But our togetherness does not become genuine oneness unless we do more than simply share a common faith. It is when we love and care for each other that we begin to feel a real and close human connection that goes beyond our heads to our hearts. We can be a church community when we love each other and show our love by the way we treat each other. When we share our joys and sorrows with each other. When we care for each other in our times of pain. When we come together to celebrate our festivals and holidays. When we work with each other on the many and varied activities of the church. These are the things that really make us one. This is the same oneness that the Jesus we know and worship has with the invisible divine Father within. It is the oneness of love uniting. The Lord offers us this same oneness. It is a oneness we achieve, not by merely believing and sharing our beliefs, but by acting on those beliefs and showing them through our love for each other. The statement of faith that we say together each week ends with the words, ". . . they are saved who believe in him, and keep the commandments of his Word. This is his commandment: that we love one another, as he hath loved us." Our love for each other is directly connected with keeping the Lord's commandments. When we are following the Lord's teachings, we are loving each other, because that is what the Lord's teachings are all about: how to love each other and not hurt each other. Only when we do this can the Lord can show us his love. Of course, the Lord always loves us, no matter what we do, good or bad. But when we do not love each other, we reject the Lord's love, which means that we cannot feel it. On the other hand, when we do love each other, the Lord can come into our lives in ways stronger than we could have ever imagined. In our reading from Deuteronomy, the Lord makes many promises to the children of Israel if they will only obey him and keep his commandments. Spiritually, these are the same promises the Lord makes to us if we will keep his commandments. Whatever our material circumstances, he will bless us with a rich and full spiritual life, with deep and satisfying friendships, and with a sense of love and of purpose in our life. In other words, the Lord will bless us with a deep and spiritual oneness with himself and with each other. This is the oneness that the Lord has within himself. It is the same oneness that he wishes us to have in him, and with each other, so that we may be completely one--with the Lord's love within us, and at the center of all our relationships with each other. It is the oneness of mutual love and understanding. 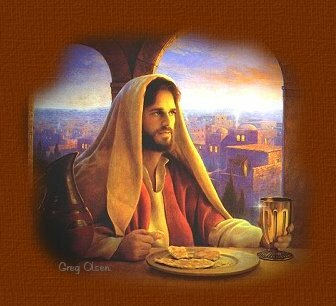 Today we celebrate these gifts from the Lord by gathering together to eat the bread and drink the wine of holy communion. Amen.